As I mentioned in my previous post, Saturday night was the Notte Bianca in Marina di Massa. Effectively this is an “all-nighter” but rather than a single club, in the whole town. There are stalls (selling trinkets and hand-made stuff (i.e. crap), food and, in the case of the one on Saturday, beer (which, of course, we had to try)). And what I forgot to mention in the last post was something I thought of whilst we were watching the concert. The street were FULL! Absolutely packed with families, couples, children and ……. YOUTHS. And, what struck me was that, in the UK, such a thing would have been a night for DRINKING. And by drinking I mean alcohol and lots of it. So, there would have been young people who, almost certainly, would have had a little (read A LOT) too much to drink – by about 11 p.m., if not before – and would be staggering around, possibly vomiting, possibly lying in the street and probably fighting. The weather was warm and very pleasant. There were indeed “gangs of youths” – but they were walking around in groups, talking, laughing and, although they had possibly (even probably) been drinking, there was no staggering that I saw, certainly no vomiting or lying in the street and definitely no fighting. Italians don’t tend to drink alcohol until they can hardly stand up. They seem to know when enough is enough. And, even if they do get drunk, their pleasant side seems to come out. Italy makes me feel safe. I can walk the street of a city (although I’m sure there are areas of any city where walking around could be a little hazardous) and not feel I have to keep an eye out for drunk people who just want to fight. Maybe, after we left (about 1.30 a.m. – so quite early, I suppose) it got more like a British all-nighter – but I doubt it. I know that there are stories about kids getting drunk more often. But I don’t really see it much (and I live in an area of Milan with many popular bars for the yoof of Milan). And, certainly, there’s not the aggressiveness between people that there is in the UK (especially when mixed with a bit of alcohol). So, one can enjoy it. If I had kids, I wouldn’t be worried about them being with me at these events. It would be OK. And there are many young children and babies around. I wonder if this aggressive streak in something in our genes? Anyway, for me, it’s one of the beautiful things about Italy. Thank goodness it’s too expensive for hordes of Brits to descend upon and create a more dangerous and unpleasant place. We went on Saturday. We were late in the end, of course. We arrived at the Viavai Bed and Breakfast. We were shown to our rooms. The lady, Francesca was so sweet and the place was an absolute delight. I would definitely go there again. It’s about half an hour from Turin in the old part (read hill-top town) of Casalborgone. For the afternoon, we went for a drive around the area, finishing at the Abbazia di Santa Maria di Vezzolano, which was rather a pleasant surprise. 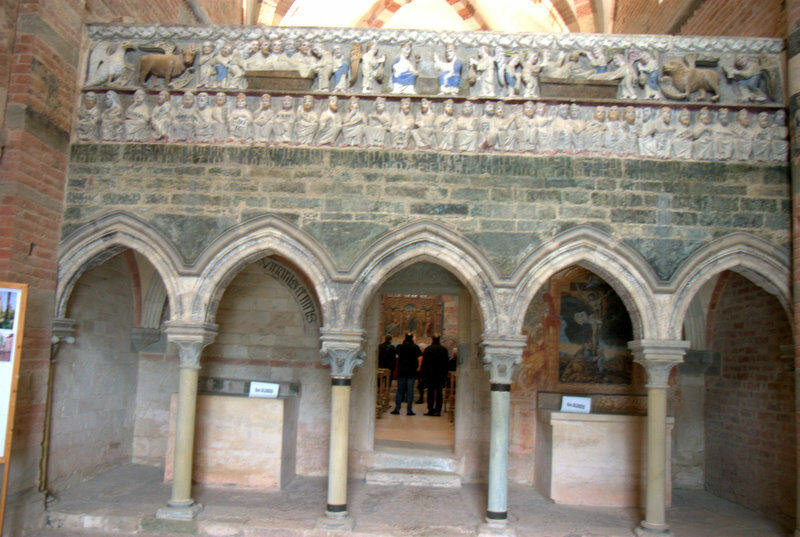 I particularly like the frescoes and the frieze at the entrance (which, I hope, is pictured below – but not my picture). It’s worth a visit and will probably take you about an hour to walk round, at the most. But it is lovely. We had a coffee at the coffee shop in the car park. It was just like one of those places in the UK at a castle or something – run by volunteers with home-made cakes and things. Except, here, was local wine. The guy serving looked like he was two steps away from his grave but he was very nice. One of the things I like about F is that he drinks cappuccino at any time of the day. We sat outside on the wooden terrace. We had jackets but it was quite warm in the sun. We went back to the B&B and got ready to go out. Before we went, we had a little walk around lower CasalBorgone and upper Casalborgone. The upper part being the original medieval town and the lower part a later addition, as is normal here. But what a nice place. The lower part had the shops and the restaurants. Quite pretty. Not somewhere I’d stop if passing through but worth a look if you’re staying there. The upper town was medieval and, apart from houses, had nothing in the way of shops or restaurants – but pretty nonetheless. Then we got in the car to drive to the restaurant. The food part comes in another post. The next day, F had thought it would be nice to go to the Chocolate Festival at a place called None, pronounced nonay and not nun. F had looked at the site and said it had stalls along the streets. We arrived and found it was true – there were stalls along the streets – selling all manner of items, as any normal market! The chocolate event was in one (not so big) marquee. And mostly it was full of shops from Turin and nearby towns selling, unsurprisingly, chocolate! We got to taste some and bought some things including, in my case, a couple of bottles of chocolate liqueur. But we were a bit disappointed. I expected some exhibitions and some history of chocolate or something, rather than just stalls selling the stuff – however nice to eat they were. Ah well, onwards and upwards. I had already said that I really wanted to go to Turin as I had only been there once (when I went to look at a flat for V when he went there for the Olympics) and, although it filled me with bitter-sweet memories (for his stay in Turin is what really started the end of V and I), I wanted to erase those and also see something of the city which, apart from a big square in the middle, I couldn’t really remember. Driving in along the wide boulevards, it seemed more like Paris than northern Italy. It really looked quite an elegant place – and I wasn’t to be disappointed. F had been there before (as part of work) so we parked right in the centre. We went, first, to a shop that he knows because the guys that run it are customers of his company. In fact, he was, until this year, responsible for the sales to them (they used to ask for him). We had a bit of a chat. They were very nice. Then F wanted to go to the Museum of Cinema which is in the Mole Antonelliana – some tall tower thing that, apparently, is one of the main symbols of Turin. Sometimes I feel that I have learnt nothing whilst here, in Italy. The queue for the trip to the tower and the museum was over 1-hour-wait long. But I noticed that there was another entrance which said Museum and there was nobody. I suggested that we ask the guy controlling how many people went through at a time. F didn’t seem to want to do it but I knew how much he wanted to go into the museum and so I went and asked. Yes, we could go to the museum only and yes, we could use the other entrance and yes, there was no queue. Result! I cannot adequately describe how wonderful this museum is. I would, in fact, recommend it to anyone coming to the northern part of Italy as a really good place to go – particularly if it is raining (which it wasn’t). Stunning, magical, interesting, exciting, informative and very, very interactive are some of the words that might help to describe the experience. It lacks only one thing – a clear way of going round it so as not to miss anything. Lots of buttons to press to see how things work, lots of film clips (mostly dubbed into Italian) but truly wonderful. We spent a few hours there but I could go back and spend all day there. For an Italian Museum, it was truly the best I’ve seen. I could spend longer in Turin and, I’ve no doubt, we shall go again. Quite a beautiful city. The feel is different from Milan. Surprisingly (well, surprisingly for me as I always think of it as the Detroit of Italy) it was elegant, chic and beautiful. More so than Milan although another city that does not fit your stereotypical thought of an Italy city. Florence this ain’t. But, in it’s own terms, possibly more interesting. Maybe even more than Milan (and that’s saying something as I love Milan). We went back to Vaivia and went for our meal (see, probably, next post). Sunday dawned bright and clear (as Saturday had been). We left the B&B and decided to drive back slowly, avoiding the motorway. Our first destination was Casale Monferrato. We had no idea what it would be like but it meant that the navigator would avoid the motorway. We stopped in Casale Monferrato. It was OK but nothing much. I’m sure there were things we might have missed but the day was nice and we sat outside for a coffee. Our next destination was Vigevano in Lombardia. A colleague at work had told me it was nice – but that’s not why we went. We only went because it was on the way home. We parked and walked towards the main square. We saw the facade of the church at the end of the sqaure. It looked nice but when we turned the corner it was like ….WOW! It reminded me of St Marks’s Square in Venice …….. but more beautiful. On three sides were the most beautifully painted (I suppose) buildings, with arches underneath. The roof of the buildings dotted with chimeny pots, made of brick, of all shapes and sizes that made it seem as if it had come directly from some fantasy book town. We walked around the town a bit and through the castle grounds and through the arch under the tower, down the steps and back to the square. Stunning. Designed by Da Vinci, it is amazing. We went for lunch in the square – eating outside as it was still warm enough. It was all lovely. Considering this is only half an hour or so from Milan, it was as if we were in a different world. It was, all in all, a truly lovely weekend and lovely anniversary day yesterday. Milleluci – restaurant or bar? But he wouldn’t tell me over the FB chat. He waited until we were there. We were using another Groupon coupon. For a restaurant called Milleluci. On FB chat I translated it as ‘a thousand lights’. “Yes”, he said, “that’s correct but I’ll have to tell you later why it’s very gay”. I got there first. It was very gay. There were gay people outside and when we got in, it was very gay. It’s a bar and a restaurant – bar at the front and restaurant at the rear. It’s open from 6 p.m. until 2 a.m. The service was great, especially as F did his usual and chatted to the waiter (maybe owner) about the restaurant and how fabulous it all was. Milleluci was some TV programme or something with Mina and some other singer. All very showy and very gay. It’s a restaurant that has memorabilia from that time (80s, I think). It’s red. And black. It has hand-painted red tables with a picture of an Italian diva of that time pasted on top. It has hand-made posters/pictures on the wall – again of the divas of that time. The music is also of that time. There is a glitter-ball in the centre of the restaurant/bar. I suppose it’s mainly for the bar but WTF? V and I used to go to this restaurant before, some years ago, before it became a very gay restaurant/bar. When it was run by some North Africans/Turkish people or something. Anyway, then they closed. Since then there have been a few restaurants and bars that have opened in it’s place ….. only to close within a year or so. The last I knew, it was a sushi restaurant – that was always empty. It’s a nice, trendy bar/restaurant. The waiter (or owner) was very nice. We had our plate of cold meats and salami to start with a prune/sausage/sage and something ‘thing’ that was lovely. We had a glass of prosecco as well. Then cold meats were nice. It came with a kind of onion marmalade that was also nice. F chose some wine. It was good. The next course was a choice from their range of pasta, chalked up on a board. F had leek and something (which was really lovely) and I had the taglietelle with ragù (meat). I wish I had had F’s. Unfortunately, mine was not so brilliant and part of the pasta was dry and another part it had stuck together. But the taste was OK. The main course was a choice of two meat dishes. I chose the costata (basically a chop) which came with potatoes. F, not liking meat, had one of their starters. Burrata I have mentioned before. I wish I had that too rather than my chop. Burrata is a kind of mozzerella. It is like having a soft, light butter but it is really divine. F’s was as good as I have tasted. Unfortunately, although my chop was cooked fine, it was tough. The potatoes would have been better if they had been a bit crispy – but they had a nice taste. The meat was nice tasting – it was a shame it was not such a good piece. Then I had some chocolate thing, whilst F had their fruits-of-the-forest cheesecake. This was the only time I preferred my choice. Cheesecake, here, in Italy, I find too heavy. We paid €20 for the wine. I suppose a meal with antipasto, secondo and sweet would have set you back about €25 per head – so, in the end, we would have paid €70-80 with the wine – but, obviously, we had more food than we would normally have. It’s a nice, friendly place. We would (probably will) go there again but I will be more careful with my selection next time. Also, I won’t eat so much because now I am very fat. In the end, they asked us to come to their one-year anniversary party, next Monday. Yes, they were very nice people. After all, they were gay and, as F said, “Gay people know how to treat their customers well”. It made me laugh …. inside, of course. We talked about the Knox verdict and stuff as well. I will give you the results of my “survey” in the next post. It was all a bit unpredictable. I didn’t get up so early and, when I did get up, I had a drink and cigarette ….. or two. Still the day looked quite nice. I went out with the dogs, driving them to the dog walk. The sun shone and it was quite warm – almost hot in the sunshine. I took them back and, on arriving back at the house, the weather seemed a little bit more cloudy. Still, I thought, if it changes, I can always come back. So I drive off to the beach and park. I arrive at the café on the beach. The café looks shut. There is a table where some women are chatting. One of them is the beach owner’s wife and another is the woman who makes the sandwiches in the little café. I ask if the café is shut. She explains that they had to close the shutters because of the wind. Indeed, it is very windy. She asks me what I want. I ask for a cappuccino. I ask if there are any brioches. She says there aren’t. It’s OK. I sit down with my coffee at one of the tables. I take the first sip and suddenly the women get up and move to be under the umbrellas. It is raining slightly. It may not amount to much but the sky looks quite ominous. I drink my coffee quickly. However, by the time I finish, it is raining heavily and the few people who were on the beach are packing up. I offer to pay for the coffee but she tells me not to worry. I kick myself for not getting up earlier – getting down here for a last swim. It is, after all, probably, the last of this season – at least for me. Saturday was wonderful. Clear skies, very warm. When I left (the beach) about 5.30, it was still very warm and yet, half a day later it is as if it is autumn. In fact, autumn has arrived. The rain, the cold – the miserableness of it all. It’s all quite sad, really – AND F isn’t here to make me feel better. I want summer back again. The first day of September. Not, officially, the first day of autumn – but it might as well be. Thunderstorms and showers – oh, yes, and a bit of sun. It’s still warm though, which is nice. I mean, warm enough to still be wearing sandals and a T-shirt (although, as I write this I am not wearing those things – but I was at 6 a.m. this morning). And I’m sure that it’s not it, really. I’m sure we shall have some really nice warm days during September and, if we’re lucky, through to October too! I went out for a drink last night with An, F’s friend. On waking this morning I got the usual after-a-night-drinking-and-having-too-many-and-not-keeping-my-mouth-shut thoughts. I.e. I said too much about F and stuff. I shouldn’t. But it’s ages since I’ve been able to ‘chat’ with someone. Especially a woman and so I kind of ‘let go’. Damn. Oh well, I’ll get over it. F is away. I join him tonight. Me and the dogs. The weather will be better apart from, maybe, Sunday. But it’s OK anyway. My head, my face and what actually comes out of my mouth. It is 7.30 a.m. The sign reads 25°C. I like it a lot although it is pretty humid, especially last night. And, about last night. We went for a beer, just the two of us. We were chatting and P, my next-door neighbour came into Polpetta. We were chatting. She’s giving up her flat. Her lease runs out and they are increasing the rent – considerably. It’s too much for just one person and times is hard, especially in her line of work. And, so, she’s moving out of Milan, in November. It’s a shame as she is the only one in the building that I speak to. F asked her about her rent. She does have a really good deal now, for sure. F and I talked about the flat below mine. I have asked about the cost of that flat. They will let me know in September. Then he asked about checking out the one with the terrace that is opposite the courtyard from mine. And then he said (again) about how he couldn’t live with anyone again. The reason is: what happens when we split up? I don’t say anything stupid like ‘Well, that’s not going to happen’. That would provoke the response of ‘You never know. Nothing lasts forever’. Instead I say, ‘Yes, I understand what you mean’. And, I’m not really sure how this happened, but then he said, within the next 10 minutes that, perhaps we could live together and ‘would I want that?’. My face stays flat. Without emotion. In my head I am screaming that yes, of course that’s what I want. My face says nothing and my mouth says, ‘Well, at least I wouldn’t have to worry about a cleaner’ and then I laugh. It’s almost as if, if I don’t say what I really want, that’s what I get from him. It’s different to any other relationship I’ve had before. And now, because I received the anonymous email and then made an unexpected post, last night, I’ve reached post 999. As I’ve mentioned, I’ve written post 1000. I’ll set it to publish whilst I’m away. It gives you, my dear reader, something to look forward to. I hope it doesn’t disappoint and hopefully, the guy won’t manage to get my blog taken down in the meantime but I have backups and, if it does go, it should be back within a couple of days after I come back from my holiday. I have to admit, I was wrong. I was wrong about the dog walking thing. He does it if he is not having to get up early. This morning he was doing pilates and so he was getting up early (early being after 7 – which is a lie-in for me!) and so I had to get up at 5.45 a.m. Still, he does take them out in the morning, some of the time. Tomorrow, I shall be on holiday. Maybe we shall take them out together? Maybe we shall have breakfast together in some bar? That would be nice. I turned round once but he told me not to call her over. He pursed his mouth in the way that he does when he’s annoyed. He didn’t go in to tell them. The waitress had, after all, laid our table and given us menus about 15 minutes before. It did seem strange that she had not come back to take our order. She came outside several times but, each time, walked away from our table to other tables. He was getting more and more annoyed. Eventually, some 20 minutes after we had been given our menus, a waitress appeared. There then followed some dialogue between him and the waitress. It wasn’t good. He complained about us having to wait so long. She asked why he hadn’t come in to say anything ….. or something like that. Of course, that was the wrong thing to say, especially to him. The correct thing to say could have been – ‘I’m terribly sorry, sir. I wasn’t aware you were here but I shall make sure you get your order quickly’. this would have stopped him dead in his tracks since this sort of response always leaves the person with two possible options: 1. shut up or 2. repeat the things you have said, thereby making yourself look like an incoherent idiot. He explained afterwards that he was this way because a) he comes here a lot and b) that was not the right way to answer a customer that wasn’t happy. And he should know. He added, after I had suggested that ‘OK but maybe they were busy’ with the fact that the turnover of staff here is very high. ‘They change every five minutes’, he advised. He was right. The service was terrible. The shrimp club sandwich that I had was very nice, though. And the fact that we could sit outside was good. And I wore sandals until the late evening. And we’d had such a lovely walk in the park with the dogs. And I’d changed the duvet for the bedspread. And it felt more like May than April. But back to the late brunch we were having. I didn’t even realise that Elettrauto in Via Cadore DID brunch. It is conveniently situated almost at the edge of the park I (we) now go to with the dogs and it’s useful to know that they serve food at 4 p.m. – see, I told you it was a late brunch! It’s not that cheap – two club sandwiches and two beers came to around €35 – but with the weather being so nice, it was perfect. Obviously, the service was dismal but I wasn’t in a hurry. But, then, this morning I read this article and I got to thinking. There is absolutely no reason to be rude to waiters, waitresses, shop assistants nor, indeed, anyone else. At the same time, people doing these jobs should have a pride in what they do and want to give the customer good service. I am a different person when I talk to or are with my customer. It doesn’t matter what day I am having, they are the customer and should be treated with courtesy and respect. I always try to exceed their expectations but, at the very least, meet them. If I can’t then I tell them and apologise. Not really so difficult. So I am always amazed when the service leaves one feeling disappointed. And the service, yesterday, was disappointing, which was a great shame. It won’t stop me going there – but if it happened too often, it would. As it is, it does seem a great place to go for a Saturday and Sunday after walking the dogs in the park. The sun has got his hat on and he’s already out to play! In one hour I shall leave here. To complete my holiday from 2010. It’s the ‘rule’ here. On the bright side, the weather is fabulous and will get even better over the weekend. On the downside, F is still ill and so I may not be able to do as planned today. I had planned (or, rather had thought it would be a nice idea if) I take the dogs for a walk in the park when I get home and stop at a café to have something to eat and a beer – outside. It would also involve F joining us, perhaps. Oh well, such is life. I hope he really improves today as this will be the first properly fine weekend we’ve had for such a long time. I was even going to suggest going somewhere tomorrow or Sunday (with the dogs, of course). Hope you all have a fabulous weekend anyway, whatever your plans or weather are like.